Art Teacher formerly at Janesville Union School, CA. NOTE: Although the space shuttle program at NASA is no longer in existence, you can substitute more current space programs such as the Mars Rover. Teach the students how to draw a Space Shuttle doodle. Each student must have a pencil and a half sheet of paper. Ask the students to draw another Space Shuttle. Allow them to be creative, adding elements that were not in the original doodle--numbers, flags, etc. Students can use colored pencils to color the drawings. Again, each student uses a half sheet of paper. Using watercolors, students paint a space scene on a full sheet of paper. Allow the papers to dry. Direct students to cut out their Space Shuttles and glue them into their space scene. I got some really nice creations from kindergartners, and they enjoyed doing this lesson. This lesson was completed over a period of three days. You can see an article on Mark's students. Unfortunately, Mark's school no longer has an art program. Barry's Sketch Blog- You can see a space shuttle doodle here. Space Shuttle Clip Art- You can find photos and art with the shuttle. Space Shuttle Program Space Art- With paintings from the NASA Art Program. 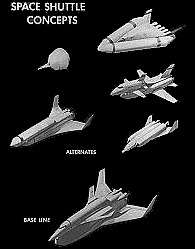 There were many designs that were considered for the space shuttle. It was not enough for the design to be pleasing to the eye, it also had to be safe and functional. There would have to be little wind resistance and a way for it to survive the heat of exiting and entering the atmosphere. It would also have to be reusable and not too costly. Believe it or not but they were already designing space shuttles in 1968 before the moon landing. Students can create their own shuttle design doodles- not just a doodle of an existing shuttle. Have them use their creativity to come up with a design of their own. On the right you can see some designs that were considered before choosing the current plan.